Open Data: What’s new in 2017? I am now in Montréal, where I participated, last Friday, in a panel on Open Data at “Science & You” international conference. It was interesting for me to reflect on how the picture has changed since my previous panel on the same topic – in Kiev in 2012. Back then, we were busy trying to convince public administrations that data opening was good for transparency and could help improve services to communities. Since then, a lot of attempts have been made in numerous countries – local authorities often pioneering the process, followed only later by central governments (one example cited in my panel was Québec City). What is made open is typically information from public registers (first names of newborns, records of road accidents) and increasingly, from technological devices and sensors (bus traffic information). Technically, it needs to be “raw”, detailed, digital and reusable. The French Interior Ministry released results of the first round of the recent presidential elections within a few days, at polling station level. This is sufficiently detailed (with over 69,000 polling stations throughout the country), raw (allowing aggregations, comparisons etc. ), and digital/reusable (so much so that the newspaper Le Monde could develop a user-friendly application to let readers easily check results in their neighborhoods). Some would also insist that “open” data should be released in non-proprietary formats (better .csv than .xls, for example). Legally, the data must come with a license that allows re-use by third parties (typically within the Creative Commons family). Ideally, no type of reuse should be ruled out (including somewhat controversially, commercial / for-profit reuse). Economically, the data should be available to all for free (or at least with minimal charges if data preparation requires extra work or expenses). If in the past few years, a lot of thought has been devoted to the “ideal” conditions for data opening and how this would positively affect public service, the data landscape has now significantly changed. Online health communities have been demonstrated to be an important part of the self-empowering experience of today’s patients. While most attention so far has been devoted to self-styled health communities, where patients autonomously share expertise and experience, today policymakers and healthcare providers are harnessing the power of this very idea and are offering similar solutions themselves. Earlier this week at the OuiShare Fest Barcelona – a major get-together of the Spanish-speaking collaborative economy community in Europe – a few of these initiatives were presented. Social Diabetes is a small company founded by and for patients, that offers a mobile app for online, real-time health monitoring services. Diabete sufferers can use it to optimally adjust their insulin dosage based on their carb count and blood sugar levels; in some cases, they can also track their exercise and patterns of behavior to receive alerts whenever relevant. Patients can share this information with their doctors, also through the app; and can discuss with other patients. This is an example of a user-based innovation where autonomous patients take the initiative, aiming to take control of their health and life. Still, physicians have been allowed in: the platform has a medical advisory board, and individual doctors can register as users to follow their patients. 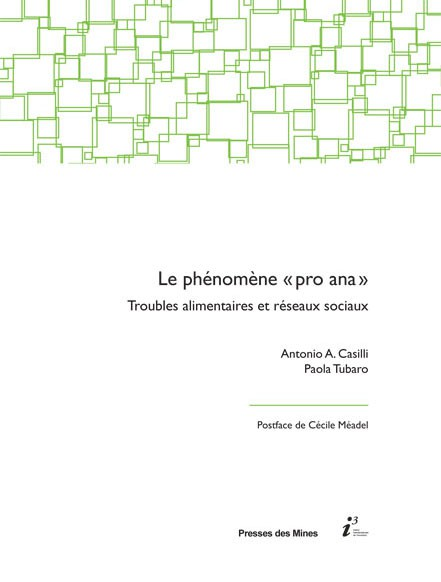 A new book is just out, co-authored by myself and Antonio A. Casilli: a synthesis of our 5-odd years research on the self-styled internet communities, blogs and forums of persons with eating disorders. For years, lively controversies have surrounded these websites, where users express their distress without filters and go as far as to describe their crises, their vomiting and their desire for an impossibly thin body – thereby earning from the media a reputation for “promoting anorexia” (shortened as “pro-ana”). In France, an attempt to outlaw these online spaces last year was unsuccessful, not least because of our active resistance to it. The book tells the story of our discovery of these communities, their members, their daily lives and their social networks. Ours was the first study to go beyond just contents, and discover the social environments in which they are embedded. We explored the social networks (not only online relationships, but day-to-day interactions at school or work, in the family, and among friends) of internet users with eating disorders, and related them to their health. The results defy received wisdom – and explain why banning these websites is not the right solution. Internet deviance or public health budget cuts? It turns out that “pro-ana” is less a form of internet deviance than a sign of more general problems with health systems. Joining these online communities is a way to address, albeit partially and imperfectly, the perceived shortcomings of healthcare services. Internet presence is all the more remarkable for those who live in “medical deserts” with more than an hour drive to the nearest surgery or hospital. At the time of the survey in France, a number of areas lacked specialist services for eating disorder sufferers. 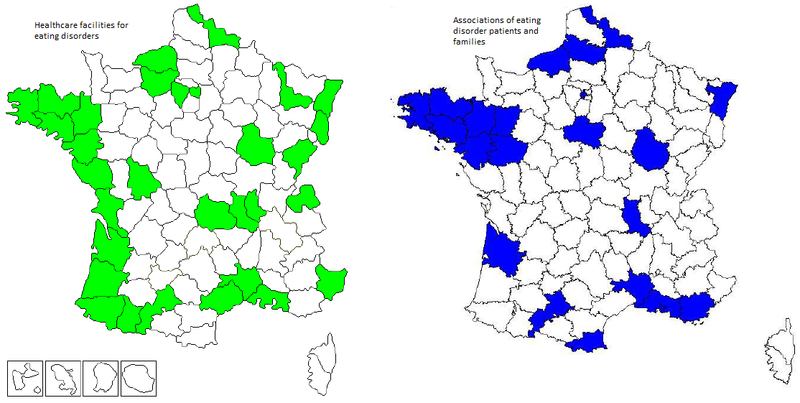 Availability of specialized services and support for eating disorder sufferers in France in 2014. Source: AFDAS-TCA & FNA-TCA. These people do not always aim to refute medical norms. Rather, they seek support for everyday life, after and beyond hospitalisation. 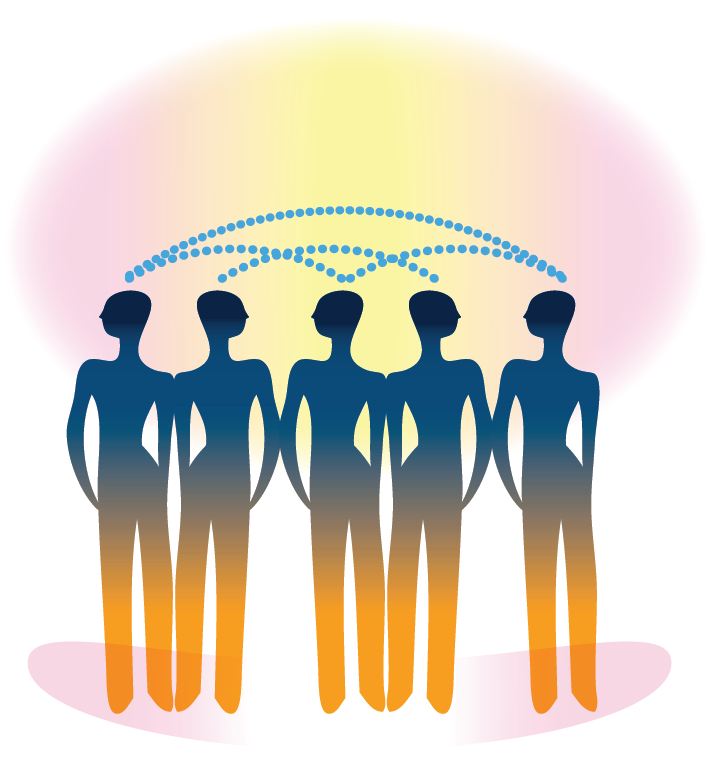 These websites offer them an additional space for socialisation, where they form bonds of solidarity and mutual aid. Ultimately, the paradoxical behaviours observed online are the result of underfunded health systems and cuts in public budgets, that impose pressure on patients. The new model of the ‘active patient’, informed and proactive, may have unexpected consequences. In this sense, “pro-ana” websites are not just a niche phenomenon, but a prism through which we can read broader societal issues: our present obsession with body image, our changing relationships with medical authorities, the crisis and deficit of our publich health systems, as well as the growing restrictions to our freedom of expression online. This article was first published on Discover Society, November 2014. Last June, a group of Italian MPs proposed jail terms and fines for authors of so-called “pro-ana” (anorexia) and “pro-mia” (bulimia) websites. These are self-styled online communities on eating disorders which are viewed as promoting extreme dieting and unhealthy eating practices. France and the United Kingdom preceded Italy’s attempt to pass restrictive legislation as far back as 2008-9, and many internet service providers also endeavoured to ban these contents. But the potential spread of health-hazardous behaviours is probably only one side of the coin, and these websites might also channel health-enhancing assistance, advice, and support (Yeshua-Katz & Martins 2013). In fact a closer look reveals that website users carefully manage their online socialisation to address their health challenges. 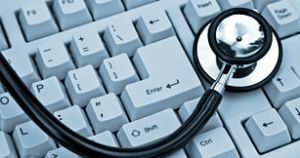 Online social spaces enable discussion around the illness and constitute a complement, albeit an admittedly imperfect one, to formal healthcare services. There is no rejection of standard health norms in the name of some extreme ideal of thinness but rather a need – or perhaps, a cry – for extra support. A social science approach brings out these results. The effect of web interactions on health does not only depend on website contents, but also on how people actually use them, share them, and access resources through them. The social, rather than just clinical dimension of eating disorders, recognized long before the advent of the web (Bell 1985, Orbach 1978), becomes ever more relevant in the current context and calls for a more comprehensive view of the “ana” and “mia” social universe. Science, like the rest of human life, is subject to fashions. Data visualisation is the latest trend: policy-makers and the public are all under its charm, and researchers magically suspend their disbelief — give me a fancy image, and I won’t look too closely at your p-values. So I was intrigued by the discovery, at a talk few days ago by Paul Jackson of the Office for National Statistics, that there are precedents, and that they have a long history behind them. The story is that of John Snow, an epidemiologist who was persuaded, against the received wisdom of the mid-nineteenth century, that cholera does not propagate through air but through contaminated water or food. But how to convince others? 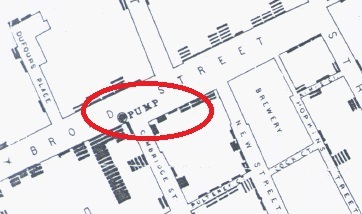 When cholera struck London in 1854, Snow began plotting the location of deaths on a map of Soho: he represented each death through a line parallel to the building front in which the person died. Snow soon realised that there was a concentration of “death lines” around Broad Street — more specifically, around a water pump at the corner between Broad and Cambridge St. He managed to convince the authorities to remove the handle of the pump, so that people could no longer use it: in a few days, the number of deaths in the area plummeted. Snow had proven his point and saved lives: using no medical trials, no sophisticated chemistry, just with some basic count statistics, and a clever dataviz. A major health data plan is on the verge of being called off, to never have a chance again. It is supposed to anonymise all the patient records in the National Health Service (NHS) in the UK, linking them together into one single, giant database, and making them available under controlled use conditions to health researchers and (controversially) to commercial companies too. Public outcry has led to the plan being delayed for six months. In an article published in The Guardian last week, Ben Goldacre, a medical doctor and high-profile media commentator on science matters, rightly identifies what the point is: in principle, the public accepts release of data for scientific purposes, but resists commercial exploitation. 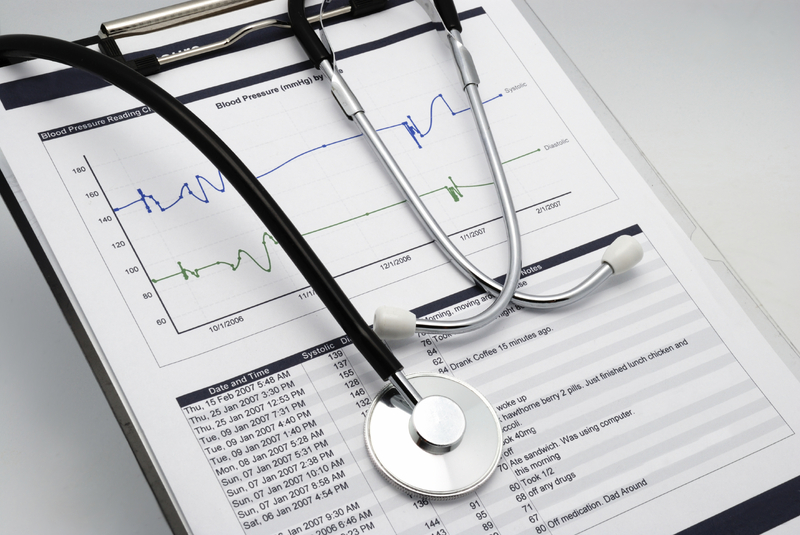 And rightly so: medical knowledge results from the study of several cases, and the higher the availability of cases, the more accurate the results; in the era of big data, it is also clear that aggregation and sharing of a wealth of data such as those held by the NHS is a unique opportunity for medical science to discover ways of saving lives. On the other hand, use of data for any other purposes looks much more opaque, and people understandably feel it might lead to discrimination and potentially negative individual consequences, for example if disclosure of the health history of a person results in higher insurance premiums, or rejection of job applications.